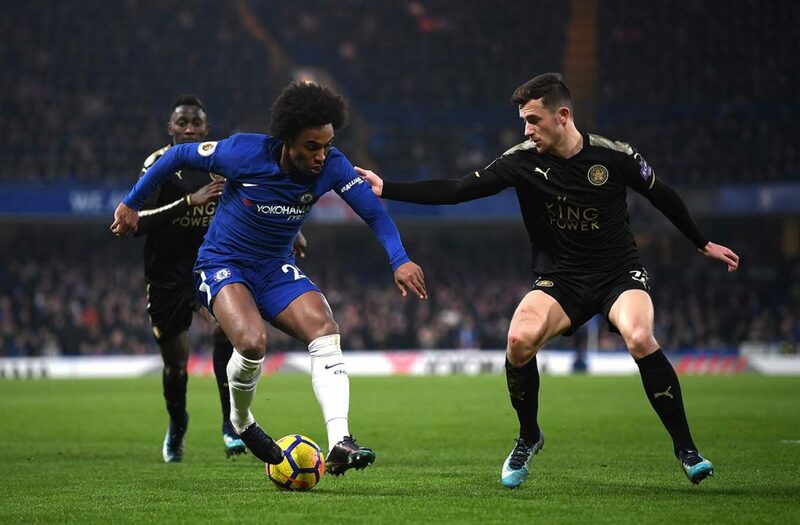 Willian is challenged by Ben Chilwell of Leicester City during the Premier League match between Chelsea and Leicester City at Stamford Bridge on January 13, 2018 in London. Chelsea were held to there third successive 0-0 draw against Leicester at Stamford Bridge, but in contrast to the previous two, it was the opposition who did most of the attacking, at least for two thirds of the match. Leicester boss Claude Puel had clearly done his homework on our 3-5-2 system, and exploited its weaknesses, particularly in wide areas. He set his side out in a 4-2-3-1 formation, and they played the ball around the pitch cleverly to move our defenders into areas of the field that allowed their forwards to exploit the space. It was particularly well-worked tactics in possession, which started at the back with their central defenders. Maguire and Dragovic sought to spread the ball wide to full backs Chilwell on the left, and Amartey on the right at every opportunity. When either of them advanced, Conte had instructed his players to deal with this in one of two ways; Either Fabregas or Bakayoko (dependent on the side of the pitch) would pull wide to close the ball down, or one of our wing backs, Alonso or Moses, again dependent on left or right side, would push forward to close the ball down. Leicester were wise to both options though. Take the left side as an example. Chilwell received the ball from Maguire on numerous occasions, and advanced forward. When Fabregas came out to him, he could play the ball inside to Wilfred Ndidi. With Leicester having two deeper midfielders, James and Ndidi, It was difficult for our central three to press them, as Kante was occupied with Okazaki in front of our defence, and Fabregas and Bakayoko couldn’t press up as they would be caught out of position if the ball was moved wide again. Aware of this, Conte had instructed Moses to press up on Chilwell as and when required. Azpilicueta was often seen encouraging him to do this. But Leicester’s well-drilled side had a plan to counter act this as well. When Moses went tight, Azpilicueta would have to come over to pick up left-winger Albrighton. Unlike a lot of sides who play a front three with narrow wingers these days, Leicester deployed Albrighton and Mahrez wide on the touchline on each side. This then meant that for Azpilicueta to cover Moses, he had to come right out wide to pick up Albrighton. This then left a big hole in the back three. With this happening on both sides of the pitch, Vardy was running into these channels continuously, and Leicester were able to find him regularly. He had three very good chances in the first half as he exploited this space. The first of those saw Chilwell curl a ball into the space in the inside left position, which Vardy ran onto, but his volley only found the side netting. Next he got in down the inside right channel, this time after James had evaded challenges from our whole midfield before putting the England forward in, this time he fired wide across goal. Cahill was unable to cover his runs and was getting pulled all over the place. He was to go off injured shortly after as he hurt himself turning to track another Vardy run. Albrighton dodged Moses to cross low into the box, and Mharez skied a great chance into the Matthew Harding upper. Mahrez was the provider next, as he skipped past Rudiger, pulled wide by Leicester’s now familiar, but difficult to prevent tactic. His low cross just evaded the boot of Vardy at the far post. It was evident by now that our limitations were formation related, and a switch to 3-4-3 was required post haste. This was not only because of our defensive frailties, as we struggled in attack as well. Hazard and Morata were pretty much left to do it themselves in the opposition half. Too often pinned back, Moses and Alonso struggled to provide width going forward. Hazard picked up the ball as he so often does, by dropping off, and turning between the lines, but this was a day where his passing in the final third was not up to scratch. He gave the ball away increasingly as he attempted to link with Morata. The Spaniard faired no better. Often his only ammunition was provided from high balls up to him, and Maguire beat him in the air almost every time. When he did receive it on the ground, he was more often than not isolated and out numbered. Our only chances of the half were to come from the right boot of Cesc Fabregas. He received the ball in the right side of the area from Moses, before turning and shooting, but Schmeichel held it at the second attempt. He was to have the best shot of the match next though. He received it right of centre, roughly twenty or so yards out, and fired a dipping shot towards the far top corner, but Schmeichel was there again, stretching to divert it over the bar. A fantastic save. Into the second half, and Mahrez attempted to win a penalty when going at Christensen inside the box, but was lucky to escape without a card for a blatant dive. With no luck in attack, and Leicester still a threat going forward, Conte finally switched to 3-4-3 on the hour. Pedro and Willian replaced the ineffectual Hazard, while Fabregas was the midfield makeweight in the tactical re-shuffle, although arguably it would have been better to keep him on the pitch, and replace Bakayoko on this occasion. The change of shape had an almost immediate effect. Now able to defend the flanks easier, and in turn test the opposition in wide areas. Something that had been lacking until now. Willian now had Albrighton back tracking, and Pedro got on the ball both infield and on the left wing. The change had an effect shortly after, as the ball was played wide to Moses, who running in to receive it, was caught in what looked a nasty challenge from Chilwell, he didn’t receive a red card, but had his marching orders either way, in the form of a second yellow. In the long run, this was probably a negative for us. The tide had turned and we were now in the ascendancy, but now a man light, Leicester sat in deep and ran thee clock down. Forcing us to play sideways, our only chances were long range efforts from Bakayoko, straight at Schmiechel, and Pedro (likewise). Our best chance to steal all three points was from an Alonso 89th minute free kick. From a central position Just outside the box, Schmiechel pushed around his low effort for a corner. We can’t really be disappointed with a point from this one, as we deserved no more than what we got.